Title: Pipedown Solder! Berlin's Listening! 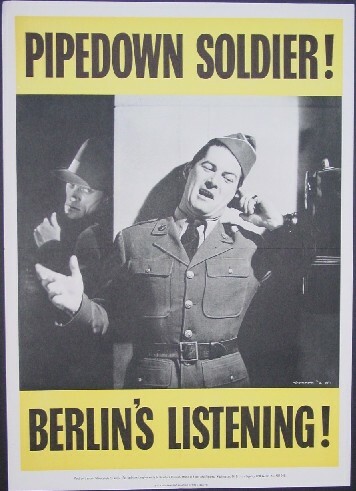 Comments: The quintessential loudmouth is here pictured blabbing on the phone while a spy type fellow is around the corner listening to everything he has to say in this poster cautioning, "Pipedown soldier!..Berlin's listening!. This poster from the Graphics Division of the Office of Facts and Figures was also issued in a "Tokio's Listening" (their misspelling, not mine) version. Size: 14 1/4 x 20"